Rebecca Jane Gilleland was seven when Comanches swooped down on her family, killed both parents, and took as captives Rebecca and her six-year-old brother William. Born in Philadelphia in 1831, Rebecca settled with her family near present Refugio about 1837. When Rebecca recounted her experiences to the Galveston Daily News in 1913, she said it was late afternoon when the Comanches surprised the family as they walked near their home. Rebecca remembered that as the Indians bore down on them, her mother grabbed the children’s arms and was praying loudly that her children would be saved when they “were baptized in her blood.” Rebecca’s father was struck down as he ran to the house for his gun. The chief’s wife scooped Rebecca onto her horse and at first threatened to cut off their hands and feet if she and William didn’t stop crying. However, Rebecca believed the woman kept the other Indians from harming her and soon began to stroke Rebecca’s blonde hair. Apparently it was the following morning, when they stopped to rest, that a company of Texas Rangers led by Albert Sidney Johnston surprised the Indians. In the melee, hand to hand combat, William’s body was pierced with a lance and Rebecca took a sharp blow to her temple. The Rangers chased after the Indians, leaving the terrified children behind. Rebecca said William roused from unconsciousness as she carried him to hide in nearby brush. It was only after the Rangers returned, and Rebecca heard them calling her name that she and William emerged from their hiding place. They stayed with William C. Blair, a Presbyterian minister in Victoria, until an aunt in Galveston came to get them. Rebecca attended school in Galveston and then was sent to Rutersville, a Methodist school between La Grange and Round Top where she met Orceneth Fisher, a minister almost thirty years her senior, who was working at the time as an editor of the Texas Wesleyan Banner. After their marriage in 1848, Rebecca and Fisher served several churches in East Texas before taking a rugged stagecoach trip to California where they found a reign of lawlessness. When the crusading San Francisco newspaper editor, James King, was murdered, Fisher was asked to preach the funeral sermon. While in the middle of his sermon, word arrived that a gang had hanged the men accused of King’s murderer. After returning to Texas in 1870 and settling in Austin, Orceneth Fisher served two terms as chaplain for the Texas legislature before his death in 1880. Rebecca’s brother William was a highly regarded poet whose work appeared in numerous magazines and newspapers before his death in 1894. Rebecca Fisher was the only woman elected to the Texas Veterans Association, and after its members who had served from the time of the Texas Revolution to annexation, all passed away, the work of the organization was taken over by the Daughters of the Republic of Texas (DRT) of which Rebecca Fisher was a charter member. She worked with Clara Driscoll and others to save the Alamo from destruction, and for several years she offered the opening prayer for the Texas legislature. Her portrait was the first of a woman to be hung in the Senate chamber at the Texas capitol. At her death in 1926 at the age of ninety-four, the body of the woman known by many as “the Mother of Texas” lay in state in the Senate chamber, the locale of her funeral service. 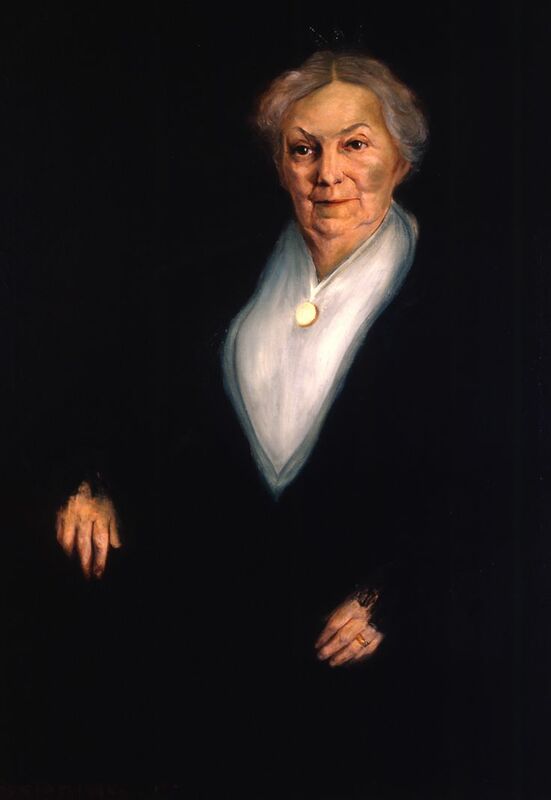 Portrait by Texas artist Royston Nave, which was the first of a woman to hang in the Texas Senate Chamber. Albert Sidney Johnston who rescued Rebecca and her brother, lies in the most conspicuous grave in the State Cemetery in Austin. Elizabeth Ney carved the life size marble likeness of Johnston which is protected from the elements by a beautiful chapel like structure. You can’t miss it as you wander the lovely grounds. I believe Rebecca is buried in historic Oakwood Cemetery located north of the State Cemetery. Yes, you are correct on both burial sites. Johnston’s gravesite is very impressive. I agree. Can’t resist writing about the amazing women in Texas history.